The crustaceans are a large and varied group of arthropods, with more than 44,000 known species. Most of them are marine, but many occur in freshwater, and a few are terrestrial. In addition to the larger and more familiar types, such as lobsters, crayfish, crabs, and shrimp, a multitude of small to minute aquatic forms are very important in aquatic food webs. The appendages and body regions vary greatly in this group, but typically there are two pairs of antennae, the functional jaws consist of endite lobes of the gnathal (jaw) appendages, and many of the appendages are biramous. A biramous appendage bears a process at its base (arising from the second segment of the appendage) that is more or less leg-like, giving the appendage a two-branched appearance. There may be an exite lobe on the basal segment, as in trilobites, and in some cases this functions as a gill. There are differences in this group in the nature of the body regions. Sometimes there are two fairly distinct (and nearly equal-sized) body regions, the cephalothorax and the abdomen, with the cephalothorax bearing the antennae, gnathal appendages, and legs. Sometimes the abdominal appendages occupy only a small portion of the total body length. There is typically a terminal telson. The cephalothorax in many crustaceans is covered by a shield-like portion of the body wall called the carapace. The abdomen lacks paired appendages except in the Malacostraca. The smaller crustaceans, particularly those in the Branchiopoda, Copepoda, and Ostracoda, are abundant in both salt and fresh water. The chief importance of most species is that they are food for larger animals and thus are an important part of the food webs leading to fish and other larger aquatic animals. A few species are parasitic on fish and other animals, and the barnacles are often a nuisance when they encrust pilings, boat bottoms, and other surfaces. Many of the small crustaceans can be easily maintained in indoor aquaria and are frequently reared as food for other aquatic animals. The Malacostraca, the largest of the crustacean classes, includes the larger and better known forms, such as the lobsters, crayfish, crabs, and shrimps. They differ from the other classes (sometimes called the Entomostraca) in having appendages (swimmerets or pleopods) on the abdomen. There are typically 19 pairs of appendages, the first 13 being cephalothoracic and the last 6 abdominal. The leg-like appendages on the cephalothorax are often chelate (pincer-like, having two opposable claws). The class contains some 13 orders. Only the more common ones are mentioned here. 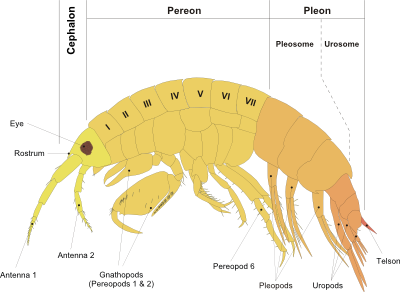 The body of an amphipod is elongate and more or less compressed; there is no carapace; and seven (rarely six) of the thoracic segments are distinct and bear leg-like appendages. The abdominal segments are often more or less fused, and hence the six or seven thoracic segments make up most of the body length. This group contains both marine and freshwater forms. Many of them, such as the beach fleas, live on the beach under stones or in decaying vegetation. Most amphipods are scavengers. Some tropical species are common on the floor of moist forests. Family Talitridae - Often called scuds or beach fleas, these amphipods can be found hopping about on beaches and living in washed-up seaweed. The isopods are similar to the amphipods in lacking a carapace, but are dorsoventrally flattened. The last seven thoracic segments are distinct and bear leg-like appendages. The abdominal segments are more or less fused, and hence the thoracic segments (with their seven pairs of legs) make up most of the body length. The anterior abdominal appendages of the aquatic forms usually bear gills. The terminal abdominal appendages are often enlarged and feeler-like. The isopods are small (most are less than 20 mm in length), and most are marine, but some live in fresh water and some are terrestrial. The marine forms generally live under stones or among seaweed, where they are scavengers or omnivores, but a few are wood-boring (apparently feeding chiefly on the fungi in the wood), and some are parasitic on fish or other crustaceans. The most common isopods away from the ocean are the sowbugs or woodlice: blackish, grey, or brownish animals usually found under stones, boards, or bark. Some sowbugs (often called pillbugs) can roll into a ball. In some areas sowbugs are important pests of cultivated plants. Family Armadillidiidae - Common family found on land. Often called pillbugs, rolly-pollies, or woodlice. This order contains the largest and probably the best known of the crustaceans, the lobsters, crayfish, crabs, and shrimps. 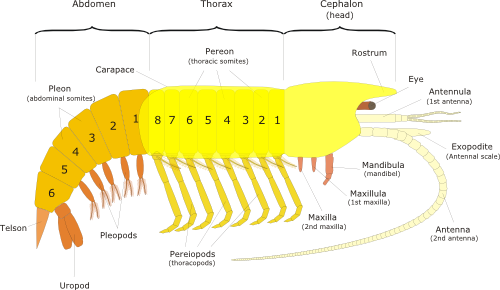 The carapace of a decapod covers the entire thorax. Five pairs of the cephalothoracic appendages are leg-like, and the first pair of these usually bears a large claw. Further appendages are found on the abdomen, with each segment capable of carrying a pair of biramous (branching into two, with each branch consisting of a series of segments attached end-to-end) pleopods, the last of which form part of the tail fan (together with the telson) and are called uropods. The abdomen may be well developed (lobsters and crayfish) or much reduced (crabs). This is a very important group, because many of its members are used as food, and their collection and distribution underpin a large coastal industry. Family Hippidae - These "mole crabs" cannot walk, but instead are adapted to burrow in the sand. Family Grapsidae - These rock crabs live on exposed rocky shores eating algae.